The Oregon Veterans' Home in The Dalles was the first State Veterans Home in Oregon, opening its doors in the fall of 1997. 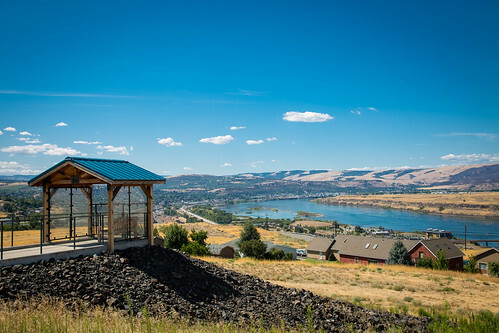 The facility is nestled on a hillside, overlooking the majestic Columbia River, with clear views of the Columba River Gorge. One of the many things that truly sets The Dalles Veterans’ Home apart from other care communities are the residents.The Dalles Veterans’ Home is situated on 15 acres located in the historic Columbia Gorge community of The Dalles. Residents have a beautiful panoramic view of the city, the Columbia River, The Dalles Dam and the majestic Mount Hood. The core mission at The Dalles is to provide the state’s aged or disabled veterans with rehabilitative, residential, and medical care and services in a home-like environment. The home also acknowledges the tremendous sacrifice Oregon veterans have made and recognizes them for their noble service to our nation. The Home can care for as many as 151 residents who need long-term care in a care facility that provides skilled nursing, Alzheimer’s and dementia-related care, and inpatient and outpatient rehabilitative care to veterans, their spouses and parents who have lost a child to war-time service. The place where honor lives, the Oregon Veterans’ Home in The Dalles, was named one of the top rated nursing homes in Oregon. U.S. News & World Report fifth annual Best Nursing Homes ratings in 2015. The ratings cover more than 15,000 nursing homes nationwide. In 2014, the Oregon Veterans’ Home, located in The Dalles, was recognized as the first and only state veterans’ home nationally to ever earn the Gold – Excellence in Quality Award for superior performance in the long-term and post-acute care profession. The award is one of three distinct awards possible through the National Quality Award Program, presented by the American Health Care Association and National Center for Assisted Living (AHCA/NCAL). The competitive award program recognizes centers across the nations that have earned this award have not only demonstrated superior quality outcomes but who continue to strive for excellence. Since the program’s inception in 1996, out of some 15,000 nursing homes in the U.S., AHCA/NCAL has recognized only 24 organizations with an award at the Gold level, the final and most rigorous level of the National Quality Award Program.